I'm a convert to the Purcell prusik for this job. Bomber *and* adjustable! A "homemade" daisy chain is not quite the same thing, as any knot in a piece of rope/sling reduces the overall strength of that rope/sling. 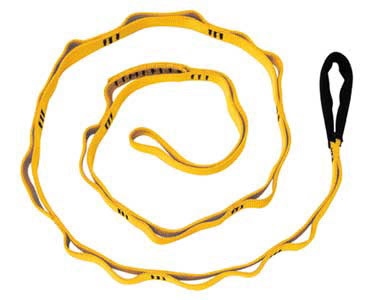 The amount of strength reduced is all dependent on the material of cord/sling, the diameter, the knot, etc. Keep in mind that even if a 22kN rated sling had enough knots in it to reduce the strength by 50%, it would still be plenty strong to clip yourself off at an anchor. Shock load that sling however, and you could easily generate 11kN (and potentially break your back, if the sling doesn't). It's good to keep these things in perspective.